Three-fifths of Alabama’s natural gas production came from onshore wells during 2017, and nearly two-thirds of that onshore production came from coalbed methane—a natural gas derived from coal seams. In 2017, Mobile was the second-largest port of entry for U.S. coal imports and the fourth-largest port for coal exports. Alabama's Browns Ferry nuclear power plant, with three reactors, has the second-largest generating capacity in the U.S. at 3,310 megawatts and is second only to Arizona’s Palo Verde nuclear power plant. Alabama ranks 7th among the states in net electricity generation, and typically about one-third of that electricity is delivered to neighboring states. Alabama has the third-largest timberland acreage among the Lower 48 states, and the resulting wood and wood waste are key contributors to the state's ranking of fifth in the nation in electricity generation from biomass. Alabama’s energy use per capita is high because of demand from the state’s industrial sector. Alabama’s three oil refineries can process about 132,000 barrels of crude oil per day. Mobile is one of the largest U.S. coal cargo seaports, handling both imports and exports. The Browns Ferry plant has the second-largest nuclear electric generating capacity in the nation. 1 U.S. Energy Information Administration (EIA), Annual Coal Report 2016 (November 2017), Table 14, Recoverable Coal Reserves and Average Recovery Percentage at Producing Mines by State, 2016 and 2015. 2 U.S. EIA, Alabama Profile Data, Reserves and Supply, accessed April 11, 2018. 3 U.S. EIA, Coalbed Methane, Proved Reserves as of December 31, 2011-16. 4 University of Alabama, Department of Geography, Physiographic Regions, accessed April 11, 2018. 5 Christy, John, "Alabama's Climate, It's the Humidity!" Community Collaborative Rain, Hail & Snow Network, State Climate Series, accessed April 11, 2018. 6 Geology.com, Alabama Lakes, Rivers and Water Resources, accessed April 11, 2018. 7 Alabama Power, Our Lakes and Dams, accessed April 11, 2018. 8 Alabama Forestry Commission, Alabama Forest Facts, accessed April 11, 2018. 9 U.S. EIA, State Energy Data System, Table C13, Energy Consumption per Capita by End-Use Sector, Ranked by State, 2015. 10 U.S. EIA, State Energy Data System, Table C10, Energy Consumption by End-Use Sector, Ranked by State, 2015. 11 Alabama Department of Commerce, Made in Alabama, Industries, accessed April 11, 2018. 12 U.S. Bureau of Economic Analysis, Interactive Data, GDP and Personal Income, Regional Data, Annual Gross Domestic Product (GDP) by State, GDP in current dollars, All industries, Alabama, 2014, 2015, 2016. 13 U.S. EIA, State Energy Data System, Table C10, Energy Consumption by End-Use Sector, Ranked by State, 2015. 14 U.S. Census Bureau, American FactFinder, Alabama, Table B25040, House Heating Fuel, 2012-2016 American Community Survey 5-Year Estimates. 15 U.S. EIA, Residential Energy Consumption Survey, 2015 RECs Survey Data, Tables HC6.8, Space Heating, and HC7.8, Air Conditioning, East South Central census division (February 2017). 16 U.S. EIA, Alabama Crude Oil Proved Reserves, 1987-2016. 17 Hall, Douglas R., and David E. Bolin, The Petroleum Industry in Alabama, 1999-2007, Oil and Gas Report 3U, Geological Survey of Alabama (2009), p. 1, 2. 18 U.S. EIA, Crude Oil Production, Annual Thousand Barrels, 2012-17. 19 Fractracker, Alabama Shale Viewer, updated January 6, 2017. 20 U.S. EIA, Alabama Field Production of Crude Oil, 1981-2017. 21 U.S. EIA, Refinery Capacity Report 2017 (June 2017), Table 3, Capacity of Operable Petroleum Refineries by State as of January 1, 2017. 22 Shell United States, Mobile, AL, accessed April 12, 2018. 23 Goodway Refining, LLC, accessed April 12, 2018. 24 Hunt Refining Company, Refining Operations, Tuscaloosa Refinery, accessed April 12, 2018. 25 Colonial Pipeline Company, System Map, accessed April 12, 2018. 26 Kinder Morgan, Plantation Pipe Line Company (PPL), accessed April 12, 2018. 27 U.S. EIA, State Energy Data System, Table C2, Energy Consumption Estimates for Major Energy Sources in Physical Units, 2015. 28 U.S. Environmental Protection Agency, Reformulated Gasoline, updated December 5, 2016. 29 American Fuel & Petrochemical Manufacturers (AFPM), U.S. Gasoline Requirements, updated January 2018. 30 U.S. Environmental Protection Agency, Gasoline Reid Vapor Pressure, Overview, accessed April 12, 2018. 31 U.S. Environmental Protection Agency, EPA Approves Request from Alabama to Relax the Summer Gasoline Volatility Standard for the Birmingham Area, June 2015. 32 U.S. Census Bureau, American FactFinder, Alabama, Table B25040, House Heating Fuel, 2012-2016 American Community Survey 5-Year Estimates. 33 U.S. EIA, Alabama Dry Natural Gas Expected Future Production, 1990-2016. 34 U.S. EIA, Estimated Dry Natural Gas contained in Total Natural Gas Proved Reserves, Proved Reserves as of Dec. 31, 2010-16. 35 U.S. EIA, Alabama Natural Gas Gross Withdrawals, 1967-2016. 36 U.S. EIA, Natural Gas Gross Withdrawals and Production, Gross Withdrawals, Annual, 2012-17. 37 U.S. EIA, Natural Gas Gross Withdrawals and Production, Gross Withdrawals from Coalbed Wells, Annual-Million cubic feet, 2011-16. 38 Coalbed Methane Association of Alabama, Coalbed Methane in Alabama, accessed April 12, 2018. 39 U.S. EIA, Natural Gas Gross Withdrawals and Production, Marketed Production, Annual, 2012-17. 40 U.S. EIA, Natural Gas Consumption by End Use, Alabama, Annual, 2012-17. 41 U.S. EIA, International and Interstate Movements of Natural Gas by State, Alabama, Annual, 2011-16. 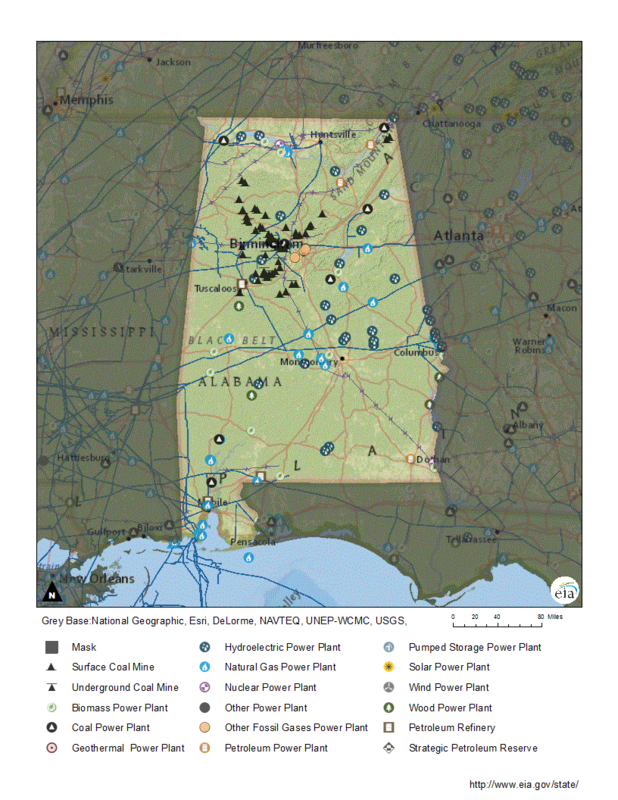 42 U.S. EIA, Alabama Natural Gas Deliveries to Electric Power Customers, 1997-2017. 43 U.S. EIA, Natural Gas Consumption by End Use, Alabama, Annual, 1997-2017. 44 U.S. Census Bureau, American FactFinder, Alabama, Table B25040, House Heating Fuel, 2012-2016 American Community Survey 5-Year Estimates. 45 U.S. EIA, Natural Gas Consumption by End Use, Alabama, Annual, 1997-2017. 46 Mining Artifacts, Alabama Mines, accessed April 13, 2018. 47 U.S. EIA, Annual Coal Report 2016 (November 2017), Table 6, Coal Production and Number of Mines by State and Coal Rank, 2016; Table 15, Recoverable Coal Reserves at Producing Mines, Estimated Recoverable Reserves, and Demonstrated Reserve Base by Mining Method, Total Estimated Recoverable Reserves, 2016. 48 Coalfields of the Appalachian Mountains, Northern Alabama Coalfields (Including Georgia), accessed April 13, 2018. 49 U.S. EIA, Annual Coal Report 2016 (November 2017), Table 2, Coal Production and Number of Mines by State, County, and Mine Type, 2016. 50 U.S. EIA, Quarterly Coal Report, 4th Quarter 2017 (April 2018), Table 2, Coal Production by State. 51 U.S. EIA, Annual Coal Distribution Report 2016 (November 2017), Domestic and foreign distribution of U.S. coal by origin State. 52 U.S. EIA, Quarterly Coal Report, 4th Quarter 2017 (April 2018), Table 13, U.S. Coal Exports by Customs District; Table 20, Coal Imports by Customs District. 53 U.S. EIA, Quarterly Coal Report, 4th Quarter 2017 (April 2018), Table 2, Coal Production by State. 54 U.S. EIA, Annual Coal Distribution Report 2016 (November 2017), Domestic Distribution of U.S. coal by origin State, consumer, destination and method of transportation, Table OS-1, Alabama, 2016. 55 U.S. EIA, Annual Coal Distribution Report 2016 (November 2017), Domestic Distribution of U.S. coal by destination State, consumer, destination and method of transportation, Table DS-1, Alabama, 2016. 56 Union of Concerned Scientists, Alabama's Dependence on Imported Coal, Burning Coal, Burning Cash: 2014 Update (January 2014). 57 U.S. EIA, Electric Power Monthly (February 2018), Table 1.3.B. 58 U.S. EIA, Electric Power Monthly (February 2018, February 2017, February 2016), Table 6.4. 59 U.S. EIA, Electricity Data Browser, Net generation for all sectors, annual, Alabama, 2001-17. 60 U.S. EIA, U.S. Nuclear Generation and Generating Capacity, 2018P (March 27, 2018). 61 U.S. EIA, Electric Power Monthly (February 2018), Tables 1.3.B, 1.9.B. 62 U.S. EIA, Electricity Data Browser, Net generation for all sectors, annual, Alabama, 2001-17. 63 U.S. EIA, U.S. Nuclear Generation and Generating Capacity, 2018P (March 27, 2018). 64 U.S. EIA, Electric Power Monthly (February 2018), Table 1.10.B. 65 U.S. EIA, Electricity Data Browser, Net generation for all sectors, annual, Alabama, 2014-17. 66 AL.com, Hydroelectric Power Plants in Alabama, accessed April 16, 2018. 67 U.S. EIA, Electric Power Monthly (February 2018), Table 1.15.B. 68 U.S. EIA, Alabama Profile Overview, Map Layers, Biomass Power Plant, accessed April 16, 2018. 69 U.S. EIA, State Electricity Profiles, Alabama, 2016, Table 10, Supply and disposition of electricity, 1990 through 2016. 70 U.S. Federal Energy Regulatory Commission, Electric Power Markets: Southeast, updated March 10, 2016. 71 U.S. EIA, Electric Power Monthly (February 2018), Table 5.4.B. 72 U.S. EIA, Residential Energy Consumption Survey, 2015 RECs Survey Data, Tables HC6.8, Space Heating, and HC7.8, Air Conditioning, East South Central census division (February 2017). 73 U.S. EIA, Electric Sales, Revenue, and Average Price, 2016 Average Monthly Bill-Residential, Average Monthly Consumption (kWh), accessed April 16, 2018. 74 U.S. Census Bureau, American FactFinder, Alabama, Table B25040, House Heating Fuel, 2012-2016 American Community Survey 5-Year Estimates. 75 U.S. EIA, Electricity Data Browser, Net generation for all sectors, annual, Alabama, 2014-17. 76 U.S. EIA, Electric Power Monthly (February 2018), Table 1.15.B. 77 U.S. Department of Energy, Energy Efficiency and Renewable Energy, WINDExchange, Wind Energy in Alabama, Maps & Data, accessed April 17, 2018. 78 U.S. EIA, Electric Power Monthly (February 2018), Table 1.14.B. 79 U.S. EIA, Electric Power Monthly (February 2018), Table 1.17.B. 80 Smith, Tom, "River Bend Solar Energy Center operational, selling solar power," Times Daily (November 20, 2016). 81 Solar Energy Industries Association, Alabama Solar, accessed April 17, 2018. 82 U.S. Army, Fort Rucker Large-Scale Renewable Energy Solar Project (April 2016). 83 Tennessee Valley Authority, TVA in Alabama, accessed April 17, 2018. 84 Solar Energy Industries Association, Alabama Solar, accessed April 17, 2018. 85 Pellet Plants, Operational, Biomass Magazine, updated May 17, 2017. 86 U.S. Biodiesel Plants, Biodiesel Magazine, updated December 31, 2017. 87 Alabama Department of Economic and Community Affairs, Alabama Energy and Residential Codes, accessed April 18, 2018. 88 NC Clean Energy Technology Center, DSIRE, Alabama Programs, accessed April 18, 2018. 89 NC Clean Energy Technology Center, DSIRE, TVA Green Power Providers, updated June 2, 2015.